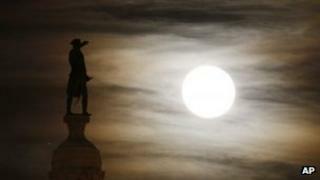 The sharply divided US Congress has been able to agree on one thing at least - that the word "lunatic" should be banned. The House of Representatives voted 398-1 on Wednesday to strike the term from all federal legislation, after the Senate did the same in May. The measure is designed to remove language that has become outdated or demeaning from the US code. The bill will now go to President Barack Obama for his signature. Senator Kent Conrad, one of the sponsors of the measure, said: "Federal law should reflect the 21st Century understanding of mental illness and disease, and that the continued use of this pejorative term has no place in the US code." "Not only should we not eliminate the word 'lunatic' from federal law when the most pressing issue of the day is saving our country from bankruptcy," said Rep Gohmert in a statement. "We should use the word to describe the people who want to continue with business as usual in Washington."